Previously, Legends division Part 1, Leaders division Part 1 & Part 2. Today, we finally wrap up this year's edition of the Hot Seat. It's been a wild ride so far. While no coach is into the red this year, it could be a rough ride for a few coaches. Let's get to gettin. The "hotness" scale, for your reference. Unlike their cellar-mate Indiana, Minnesota actually does have a strong football heritage. But it's been piled over by decades of mediocrity. 2012 was no different. While improving from their 3-9 record in Kill's first season, and barely sliding into a bowl game, it's not what it's going to take to move Minnesota forward. 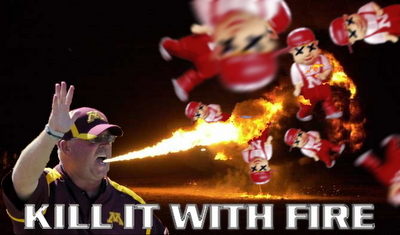 Minnesota, and Jerry Kill need a breakout year. And 2014 could be that year, thanks to being placed into the soon-to-come Big Ten West division. O' the Big Ten West...where dreams can come true. Just one more year until the path to Indy becomes at least somewhat more realistic. Unfortunately, the Legends division is not so welcoming. Michigan, Nebraska and Michigan State...and probably Northwestern are all vying for the title...and that's not going to be good for Minnesota who plays all but Nebraska on the road. Thankfully, the non-conf schedule is very tame. Schedule aside, questions about Jerry Kill's health remain a constant distraction. For the last 12 years, Kill has endured many seizures from his epilepsy. He's endured many questions as well about his ability to lead the team, and how his health is affecting recruiting. I applaud Kill's ability to keep going despite his disease, but I too wonder if coaching is adversely affecting his health, or vice versa. But Kill doesn't care for talk or criticism about his health, he's too focused on coaching, and I admire that. I think it's something that a team can rally around. Kill is a likable guy. But Minnesota doesn't need likeability, it needs wins. Returning 10 starters on offense and 7 on defense will help that cause, although MarQueis Gray is gone. I expect a pretty similar year from the Gophers from last year. Best case scenario, there's 7 wins on that schedule. But only if everything goes right. Last year we said Kill needed a good year, which he got, sorta. I'll stand by that for 2013. A slide back into bowl-ineligibility is not acceptable. 2012 was a good year for Nebraska. Only 2 regular season losses to UCLA (on the road) and a blowout loss to Ohio State (on the road) weren't terrible considering they still made it to Indy...only to be absolutely destroyed by Wisconsin, who they actually beat 30-27 in Lincoln back in September that year. Clearly Nebraska was the best team in the Legends division, but is far from a premier program that they'd like to be in the new Big Ten. Nebraska plays better at home. Clearly. So 2013 actually looks pretty good. They get UCLA in Lincoln, as well as Northwestern, Michigan State and Iowa. Plus they drop Ohio State and Wisconsin in favor of Purdue and Illinois (you're welcome). The only real tests on their schedule are Michigan and Penn State, both on the road. With 7 starters on offense (the top QB, both top rushers and the top 3 receivers) returning, that could mean a big year is in store for the Huskers. The defense only returns 5 starters, so all is not Roses in Lincoln. But I fully expect them to challenge for the Legends division. For Pelini himself? He's safe for now, despite losing in the B1G title game and the Capital One Bowl. If Nebraska fans are content with 8 or 9 wins a year for the foreseeable future, then Pelini is the man. However, starting in 2014, Nebraska is given the gift of being in the Big Ten West division. Other than Wisconsin, there's no real threat or hurdle on the way to the B1G championship every year. But if Nebraska prides itself on being a national powerhouse, then Pelini is going to have to deliver against teams commonly considered stronger, especially on the road. I used to like Pat Fitzgerald. I remember him as the heart and soul of those famous mid-90's Northwestern teams that shocked the world and went to Rose Bowls and stuff. But recently, I've been a little put off by the former middle linebacker hero (see gif above). But then, I'm not one of the 2 dozen Northwestern fans out there. They love Fitz, he's perfect for NU. Why would they ever consider getting rid of him? As long as he can plop out a 8,9 or 10-win season every few years, he's golden. Everyone and their cousin has Northwestern picked as the dark horse to win the Big Ten this year, or at least get to Indy to play the Buckeyes. Win 10 games (including a January bowl) in Evanston and people get all crazy! ...although he did finish the season with 1,371 yards with an average of 6.1 per. With he and co-QBs Trevor Siemian and Kain Colter both back on offense, things should remain uptempo even though the Wildcats must replace 3 linemen. But 8 starters back on offense and 7 on defense means that the hype machine is alive and well in Evanston. Things start off with a bang in 2013 with a trip to Berkley to face Cal, then home against Syracuse. Ohio State, Michigan and Michigan State all visit the Chicago suburb, while NU goes on the road to face Wisconsin, Iowa and Nebraska. If Pat can get the Wildcats back to 10 wins again this year, color me shocked.